Next week the polls will close on voting for Washington’s Initiative 522. 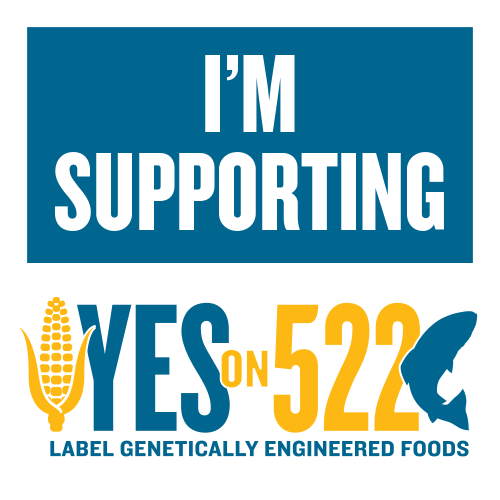 This could make Washington the first state in the US to mandate labeling of GMOs, and it will be the pivotal moment in the struggle for the right to know. Labeling opponents have raised more than $21 million, the vast majority of which has been donated by biotech companies, including Monsanto and DuPont Pioneer, and members of the Grocery Manufacturers Association (GMA). The sum is the most ever spent to defeat a ballot initiative in the Evergreen State! Let’s not let this opportunity go by. We MUST win this one so other states can follow. It’s so important to get involved in I-522, and sign up to volunteer, here. The fight on the National level is active and vigorous. The National Cooperative Grocers Association (NCGA) has undertaken a collaborative effort to raise $75,000 to support the Just Label It campaign. So far 1.3 million people have signed the FDA petition to demand labeling of GMOs on the national level. NCGA represents 134 food co-ops in 36 states, and they have worked for years on the national level to ensure food labels provide consumers with information about what’s in their food and where it comes from. If you live near one of their stores be sure to stop buy, shop and thank them for all their good work on this issue. Why is there all of this fundraising activity to support GMO labeling in the US? Are GMOs in our food supply safe? Some very informed scientists believe there is no scientific consensus on the safety of genetically modified (GM) foods and crops. According to a statement released by an international group of 93 scientists, academics and physicians, many pertinent questions remain open, while more are being discovered and reported by independent scientists in the international scientific literature. The statement was issued in response to claims from the GMO industry, some scientists, journalists and commentators that there is consensus on GMO safety. If you aren’t aware of Séralini’s 2012 GMO study, you should check it out. They tested the long-term effects of Monsanto’s GMO NK603 maize, which is engineered to survive being sprayed with Roundup herbicide. The study used rats that were fed GMO corn and Roundup alone, given in drinking water. The lowest dose corresponded to contamination found in some tap water. The results show escalation of liver and kidney toxicity, increase in tumors pituitary malfunction; all lead to premature death. The pictures are ghastly and I recommend only those of strong will to take a peak. The ironic news is that the 2013 World Food Prize was just awarded to three chemical company executives, including Monsanto executive vice president and chief technology officer, Robert Fraley, responsible for development of genetically modified organisms (GMOs). The choice of Fraley was widely protested, with eighty-one members of the prestigious World Future Council calling it “an affront to the growing international consensus on safe, ecological farming practices that have been scientifically proven to promote nutrition and sustainability.” You can read their full statement here. More than 70% of the world’s food comes from small farmers and gardeners using non GMO seeds. Shouldn’t they get an award? With all the mounting evidence and public awareness, the time is now to take back control of our food supply. We must not leave it in the hands of large chemical companies like Monsanto and end up like rats in the study. Fight for the health of our species and our planet. This entry was posted in GMO, Labeling, What is Organic and tagged Genetically modified organism, I-522, Monsanto. Bookmark the permalink. Great Blog post. Thank you for sharing it! A large amount of teenagers are previously planck satellite wikipedia seeing satellite Television totally free of charge quietly at property by using some techniques which I will probably be sharing. – Tech – Net rubric ‘Dialogues on Feminism and Technology. going at night generally accepted rules and at the most effective be subject to the theoretical and philosophical comprehension. them so powerfully without any traces of mess and oil left. energy to carry out your tasks.